I’m chatting all things coconut this month on the blog because it’s such a misunderstood food! There are some fun health benefits to it – and some negatives – but mostly it’s awesome in the kitchen. Versatile and delicious, I cook with coconut products pretty often. In honor of all things coconut, I made these Chickpea Stuffed Sweet Potatoes with Coconut and Kale that you really need to try. When I knew that I wanted to make a stuffed sweet potato recipe,Â I was looking at a variety of recipes and there was one thing missing over and over – the protein! Sweet potatoes are such a healthy food – fiber, vitamin A (that’s the orange color), vitamin C, b-vitamins – they’re flavorful, nutritious and versatile. Kale sautÃ©ed in coconut and lime is just: delicious and a nice way to enjoy this dark leafy green if it’s a bit too intense raw in a salad. My magic ingredient inÂ Chickpea Stuffed Sweet Potatoes with Coconut and Kale is definitely the chickpeas. I almost always use canned because it’s so much faster. Just drain them, roast them and use them. They’re so hands-off and a quick, easy protein source you can use in many ways – even just as a snack. I will warn you that it’s kind of hard to make these look beautiful. Scooping out the insides while maintaining the shell intact requires gentle attention. This one turned out better than another one I made because the sides of the skin ripped and it wasn’t as pretty. But it was still delicious. I took this one on a flight! Non-stinky, balanced, nutritious and flavorful, this is exactly the type of meal that will take you across the country and keep you feeling full and energized. 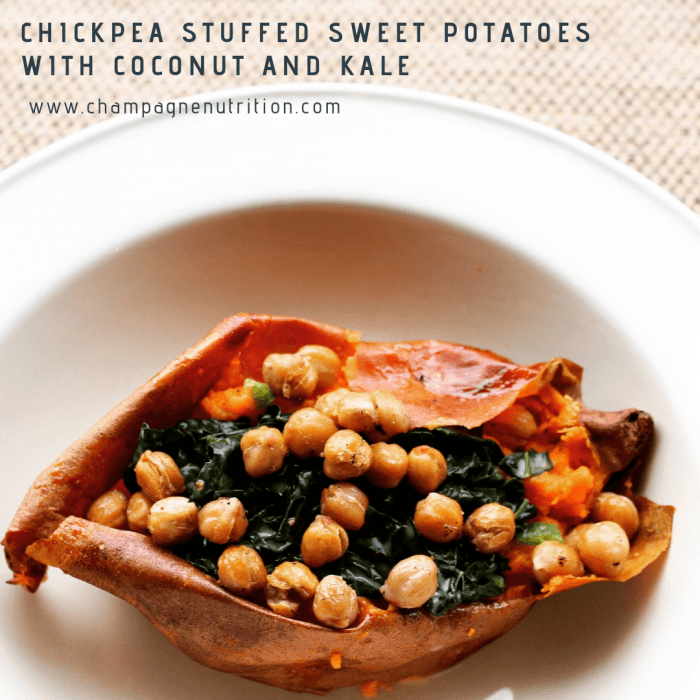 I hope you enjoy thisÂ Chickpea Stuffed Sweet Potatoes with Coconut and Kale recipe when you make it – let me know how it turns out. If you need some more plant-based recipes, try my No Noodle Vegetarian Eggplant Lasagna with Quinoa and Spinach or my super simple Healthy Vegetarian Sheet Pan Nachos! Preheat oven to 400Â°F. Rub potatoes with 1 Tablespoon olive oil; pierce liberally with a fork then bake for 1 hour or until tender. Set aside to cool. Split potatoes in half lengthwise gently. Place chickpeas on a baking sheet; pat dry with paper towels. Add 1 Tablespoon olive oil and toss. Sprinkle with 1/4 teaspoon salt, 1/4 teaspoon pepper, and ground ginger. Bake with sweet potatoes for the final 30 minutes, stirring every 10 minutes. Heat coconut oil in a skillet over medium-high. Add kale and jalapeno, stirring often, until kale is slightly wilted and soft (about 3 minutes). Add in coconut milk then bring to a boil. Reduce to low and cook for 5-6 minutes until kale is very tender. Remove from heat, stir in lime juice, and curry powder. Cut sweet potatoes in half-lengthwise then scoop soft flesh into a large bowl. Mash the sweet potato, grapefruit juice, vegan butter and remaining salt and pepper. Spoon mixture back into potato skins then top with kale mixture and garnish with toasted coconut.